Its amazing how time flies when your having fun and before you know it we're back in the UK and our Oregon Tour becomes just another memory. We began in Seattle, Washington State and drove south along the US101 entering Oregon across the Columbia River and the amazing Astoria–Megler Bridge. From here on we completed the Oregon Coast region, which runs south along the Pacific Ocean. 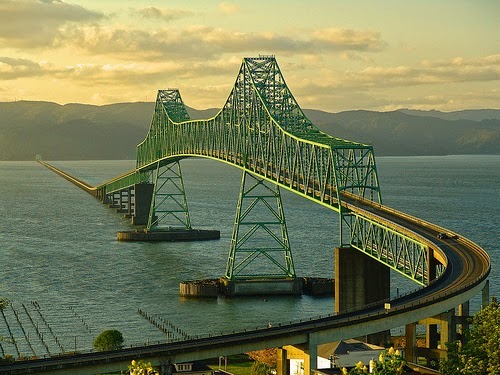 The Oregon Coast stretches approximately 363 miles (584 km) from the Columbia River in the north to the California state border in the south and our two main stopovers for this period where the city of Tillamook, the county seat of Tillamook and Bandon, a city in Coos Bay. Popping over to California for the day! Heading back north we first moved east inland to Klamath Falls for a few days stay. 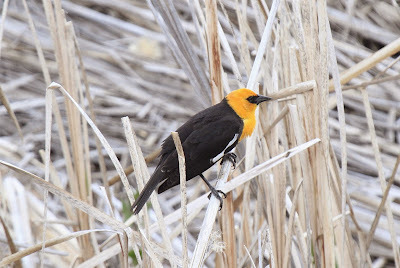 In fact during our time here we did actually travel the 20 or so miles cross the state-line and into California, this to visit the amazing Tule Lake National Wildlife Refuge and this is reflected in my North American birding list. 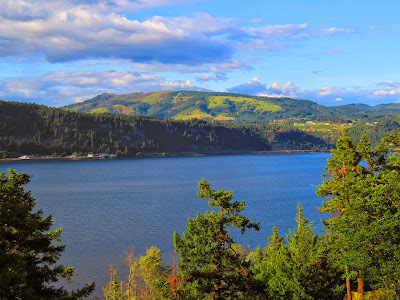 Continuing north through the mountain ranges and National Forests along US95, further stops for varying days at Bend in Deschutes County and Hood River, which is actually a port on the Columbia River! 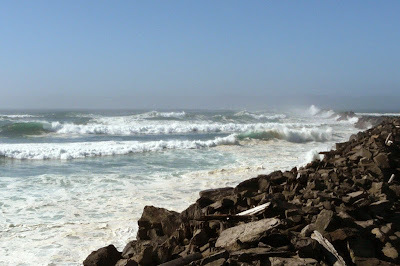 For our final few days before heading back to Seattle we moved back west to the coast and the lovely town of Cannon Beach, before continuing north once more along the outstandingly beautiful US101 and completing a round trip of 2,100 miles! As for the weather, well we can definitely tell you that along the coast at this time of year the wind can make birding a challenge. It starts off off calm enough but by lunchtime it's blowing a hoolie! Further inland, especially through the mountains it can be quite changeable as you would expect, when we arrived in Klamath for example 26C, when we left two days later 6C. 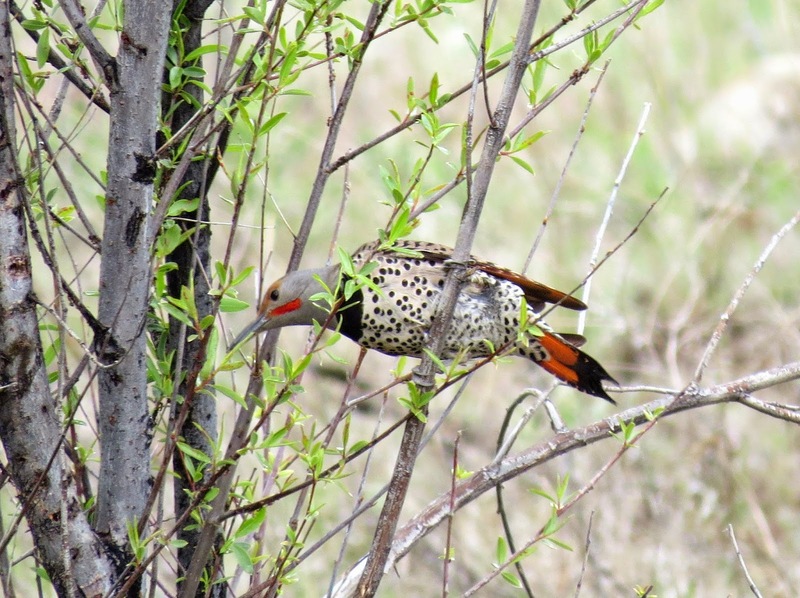 Total Species Count 174 - With 25 New North American species including: Lewis Woodpecker, White-headed Woodpecker, Tufted Puffin, White-tailed Kite, Snowy Plover, Snowy Egret & Red- shouldered Hawk. 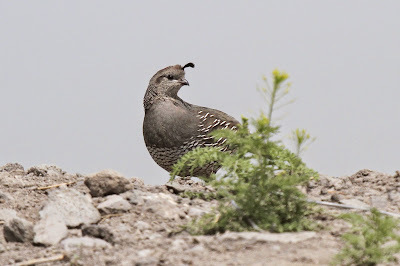 Only a single new mammal to add, when Dee discovered a Porcupine and sadly very few Butterflies or Odanata, due to the weather, so no additions there. 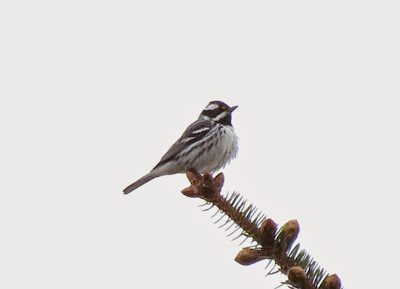 This has been our first North American birding trip outside of Canada and I can honestly say it certainly won't be our last! 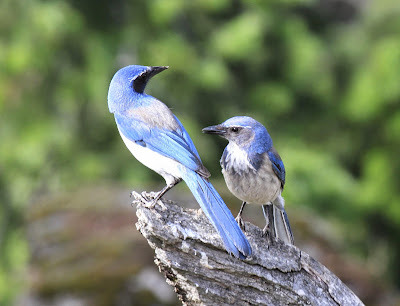 Dee and I arrived back on the Pacific coast mid afternoon for our final few days birding before heading off sightseeing and then back to good old blighty! The drive took us across country, passing through the Cascade Mountain Range and Portland but unfortunately the weather on route was mostly low cloud and rain. 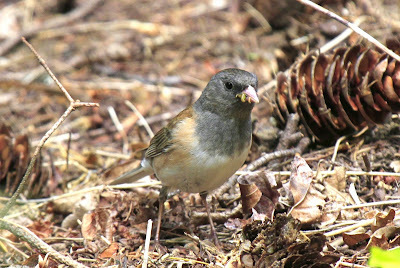 We did manage a couple of stops, picking up a few more species and these included Common Yellowthroat and Bewick Wren. 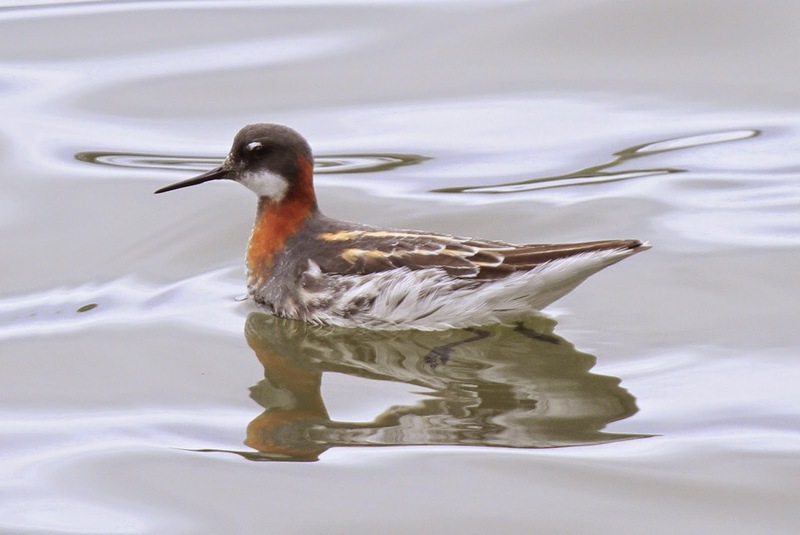 #2 Red-necked Phalarope - These birds can be quite inquisitive and come pretty close to investigate! Before booking into our hotel for the next few days we decided to check out Cannon Beach Settling Ponds. As most birders know sewage treatment plants can be quite productive, but here in the U.S. a real effort is made to encourage birding at these establishments and this particular site had an observation deck and trail , along with interpretive boards. 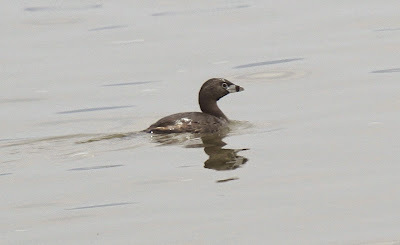 Apart from the White-throated Swifts at Smiths Rock we've seen very few Swifts on our travels but on arrival here at the ponds a half dozen small, short-tailed birds were in flight. 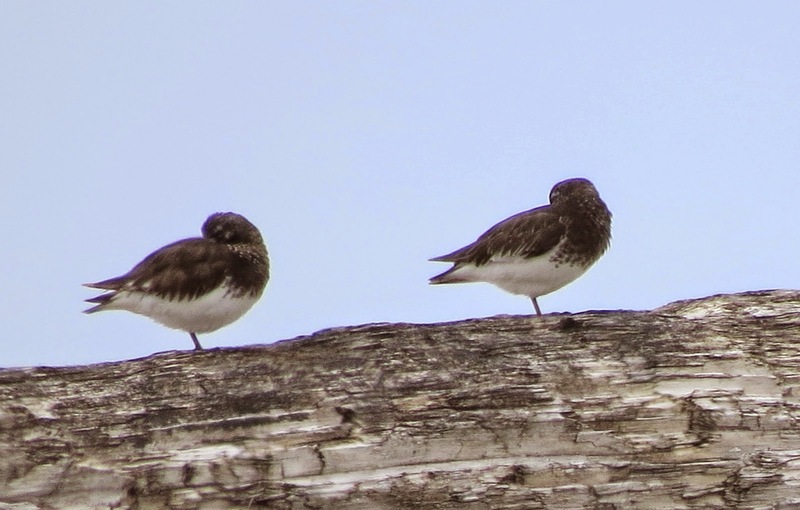 Judging by size I'd say these were most likely Vaux's Swift. Also on the wing a group of Violet-green Swallow and Barn Swallow. As we took the trail an Anna's Hummingbird entertained us, first hummer we've had in a while and the ever present Red-winged Blackbirds and Song Sparrows provided the background noise. Shore birds were only represented by (2) Spotted Sandpiper and on the perimeter of the ponds at rest were (4) Common Merganser, Great Blue Heron and Wood Duck (photo#1). On the open water (11) Red-necked Phalarope (photo#2), a single Surf Scoter (photo#3), along with (4) Lesser Scaup. Passing by during our stay, Bald Eagle, Western Gull and Raven. Many Oregon birders apparently consider Bend to be primarily a place to stop off for food and fuel on their way to points further east. But this large sprawling city on the western edge of the high desert has several parks and lakes to explore. 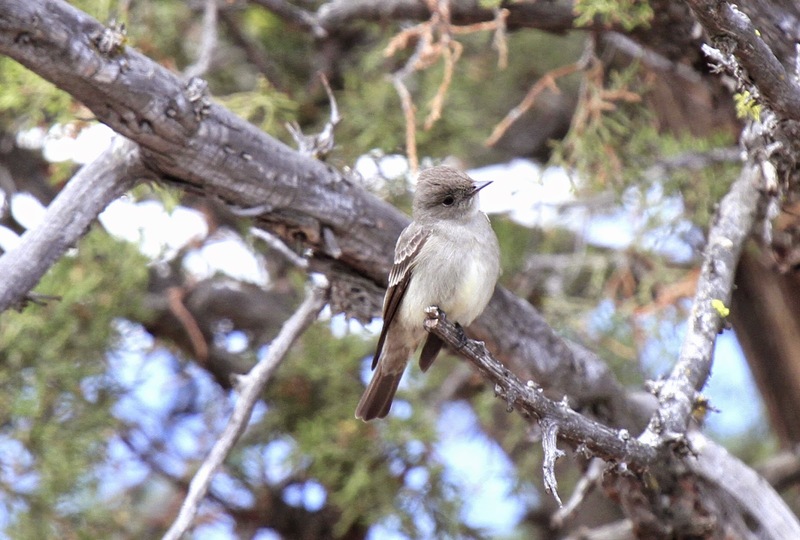 Ash-throated Flycatcher - Not quite used to seeing flycatchers of this size but what a stunner! Dee and I began at Hatfield Lakes, which is in fact a water reclamation site and offers both wetland and juniper/sage habitats. It's also a little disconcerting as right next door is a state police firing range, in the UK you probably couldn't get within miles of an establishment like this, but here we are!! Just as we found a position to scope the lake a bird took the eye in the Sage Brush below, not having seen one before a quick look at the 'Sibley's' yielded our first Ash-throated Flycatcher. 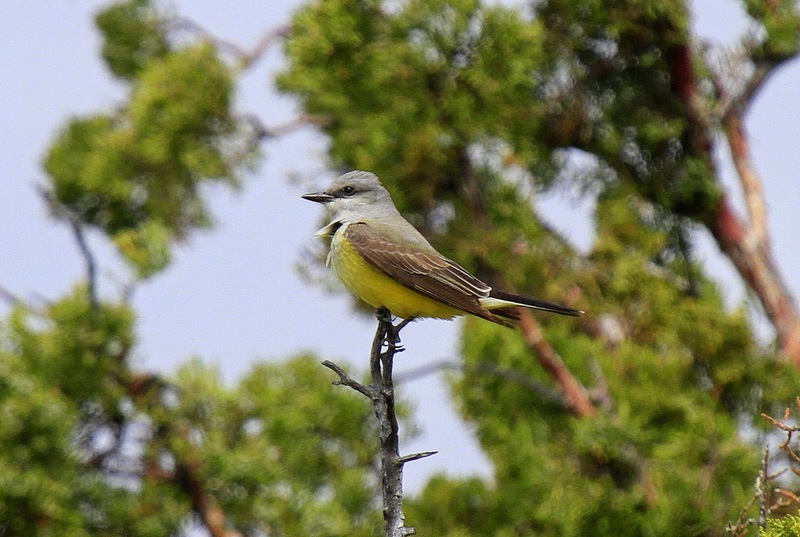 Western Kingbird - three of these beauties on the perimeter trail. A first look at the lake produced a large flock of circa 100 Long-billed Dowicher, these along with Dunlin, Western Sandpiper, Semipalmated Plover, Wilson's Phalarope and three Least Sandpiper. On the open water Eared Grebe, Bufflehead and American Coot. A trail leads around the perimeter of the top lake and as we commenced our walk a wonderful Western Kingbird flew up into a nearby tree. Western Tanager - Proud looking bird! 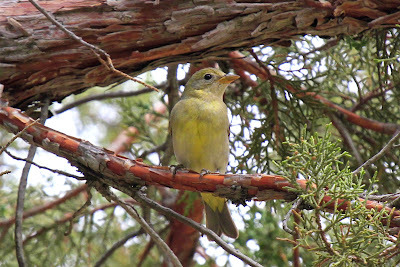 There seemed to be large number of Western Tanager around today and despite trying our best to get a photo of the stunning male the best we could manage was a female, but whose complaining! 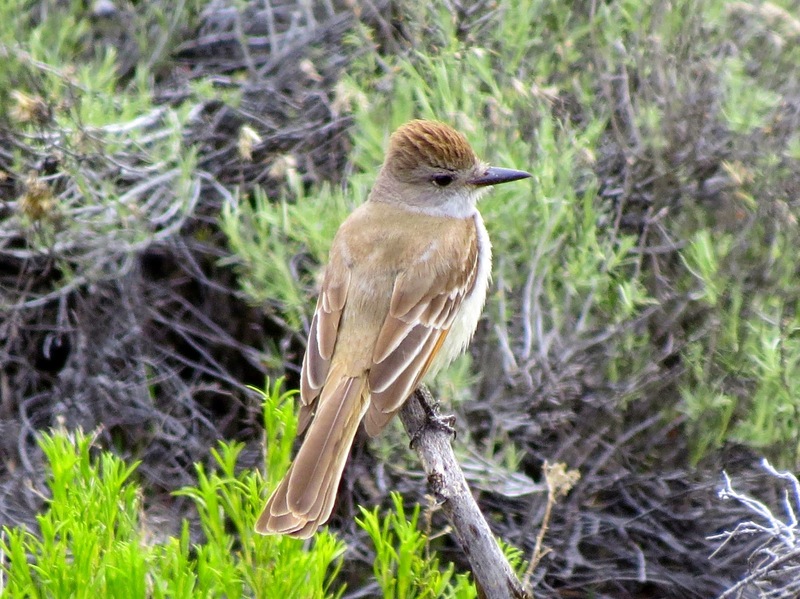 Flycatcher Sp. Best guess Hammond's ? There are at least fifteen flycatcher species to be found in Oregon and unless they call identification is sometimes impossible, with that in mind another two flycatchers seen today will have to be noted as Flycatcher SP. Other species of note included: Killdeer, Lincoln's Sparrow, Savannah Sparrow, Spotted Sandpiper, Bald Eagle and House Wren. 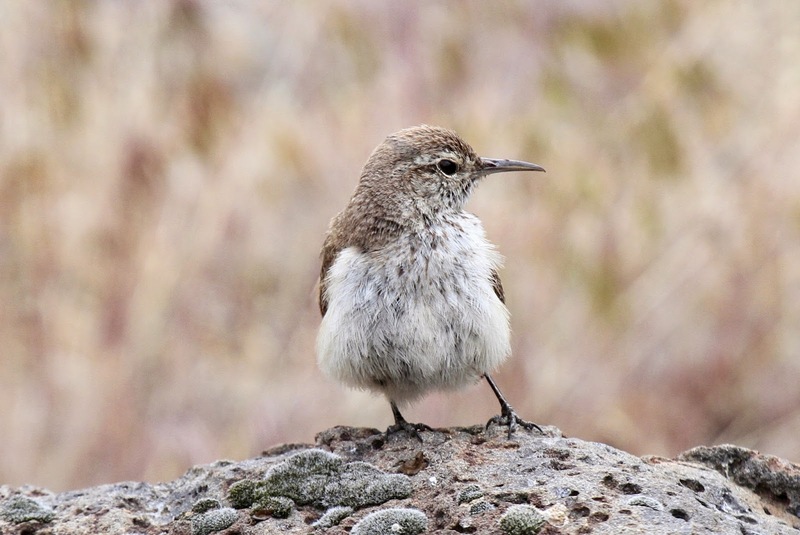 House Wren - The song has a familiar ending likened to our own Lesser Whitethroat. After lunch we made it across to Smith Rock State Park which has a nesting colony of White-throated Swifts. In fact if your just after the species, park up in the first day use area and scan the mountains, we had 20/30. Notwithstanding, Dee and I headed down below to walk the river and came across a family of Common Merganser, seven young in total. 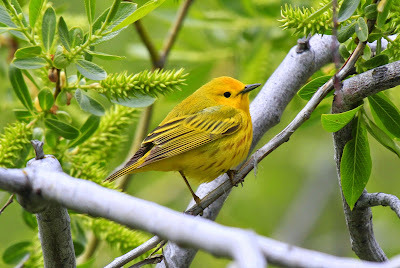 Western Tanagers were here to, along with Violet-green Swallows, House Wren, Orange-crowned Warbler and Yellow-rumped Warbler. Yellow-bellied Marmot - Another of Dee's favourites! Golden Eagles also nest here and among the score of Turkey Vultures enjoying the thermals, Golden Eagles and the odd Peregrine could easily be seen. 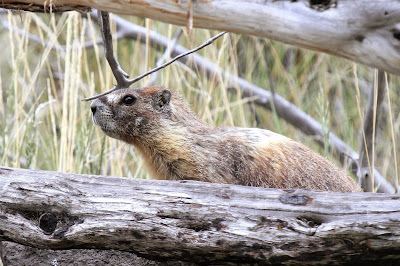 Dee had her usual moments too and a sighting of one of her favourites, Yellow-bellied Marmot made the day even more special. Tuesday we left Klamath Falls for our next destination of 'Bend' in Deschutes County, this means that we now begin to head back northwards through the mountains on our return journey to Seattle. While on route we stopped off at Wood River Wetlands, around 30 miles north of Klamath Falls. The wetlands have been recently restored, the land once used for cattle grazing for four decades. 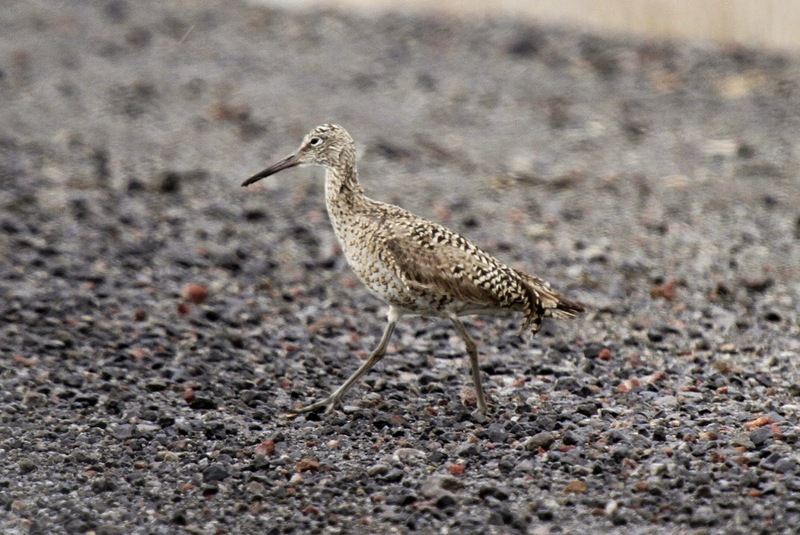 In 1996 the BLM and partners restored over 3,000 acres of wetland and two miles of Wood River channel. The wetland is located adjacent to Agency Lake on the north-eastern end of Klamath Lake. We spent a pleasant hour or so walking the woodland path which runs adjacent to the wetland area. As we set off a booming Bittern could be heard and a flash of yellow that caught the eye turned out to be a Bullock's Oriole, they nest here one local birder told us. The aptly named Yellow Warbler were in double figures and at least two Willow Flycatchers were recorded. 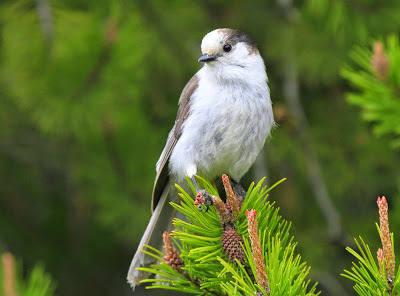 A singing Warbling Vireo, Orange-crowned Warbler, House Finch, drumming Downy Woodpecker and a Golden-crowned Sparrow before we had our first look over the open water. Here Canvasback and Ring-necked Duck and within the reedbeds the unmistakable call of Sora could be heard. Halfway through the walk Dee was in her element when she came across a Porcupine, this one curled up in a ball and fast asleep, these animals being mostly nocturnal. 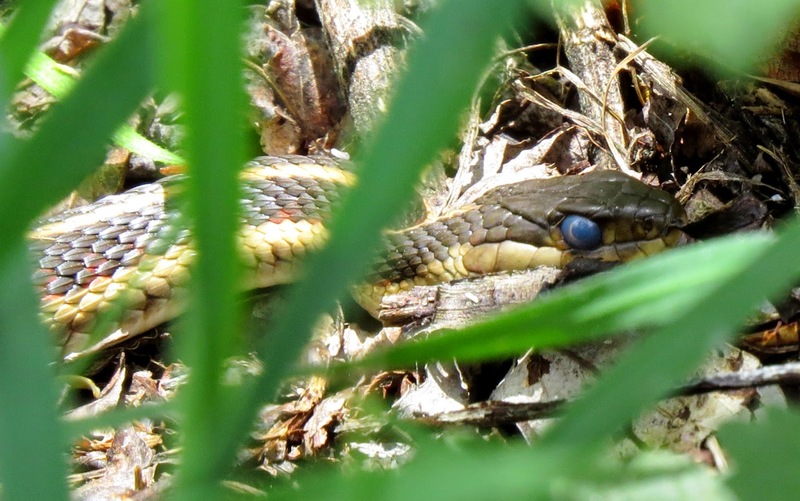 Further wanderings and more discoveries with Yellow-bellied Marmot and two Common Garter Snakes to add to her growing amphibian and mammal listings. Cliff Swallows - Gorgeous looking birds! Although the photo doesn't do them justice! We arrived at a bridge at the top end of the walk that crosses the Wood River and here it opens out to produce good views of the open water, reedbeds and surrounding mountains. 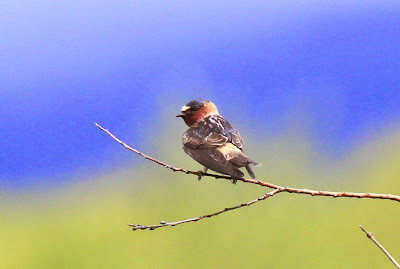 A large colony of Cliff Swallows were nesting under the rafters, an American Bittern flew over the reedbeds, two Ospreys, Northern Harrier and Raven over, plus as we were heading off back to the car a party of four Black Terns flew through. Yesterday evening after our marathon birding session we were resting in our room before dinner having a few beers and enjoying a thunderstorm rolling in over the mountains. Suddenly a White-headed Woodpecker appeared in the top of the tree just outside our window offering great views from our 3rd floor vantage point. As if that wasn't exciting enough as the storms rumbled on into the night two Great Horned Owls having a conversation just outside said window woke us around 2am! 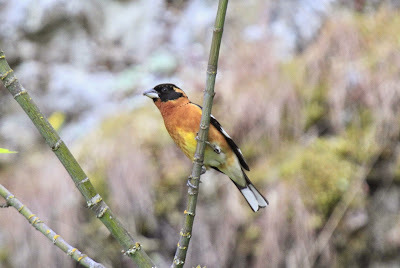 After yesterdays excitement we decided to start our day on a more sedate note, completing one of the hotel birding trails. Around 2.5 miles long the trail meanders through woods of Western White Oak, Ponderosa Pine and Juniper, ending near the Upper Klamath Lake. The outward walk was pleasant enough, if not a little overcast but the return was completed in heavy downpours and the odd rumble of thunder. The birding wasn't too bad with of note: Northern Flicker, Brown Creeper, White-breasted Nuthatch, Warbling Vireo, Blue-headed Grosbeak, Californian Quail, Steller's Jay, Blue Jay, Brown-headed Cowbird, Pacific Wren, Spotted Towhee and Tree Swallow, plus Turkey Vulture, Raven and Bald Eagle over. Willet - another addition to the birding list at Lower Klamath. After lunch we headed back over the state line once more and into California, this time to visit Lower Klamath National Wildlife Refuge. 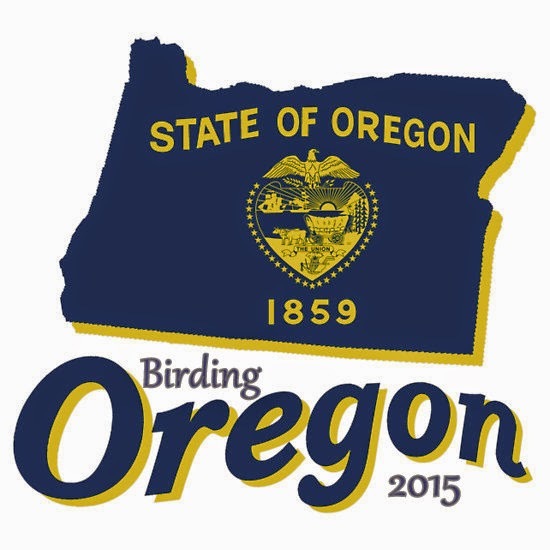 For the more autocratic bird listers this is an interesting one, as the reserve is split between Oregon and California, so be careful to remember which state your observation took place. The refuge was established by President Theodore Roosevelt in 1908, the nations first waterfowl refuge. 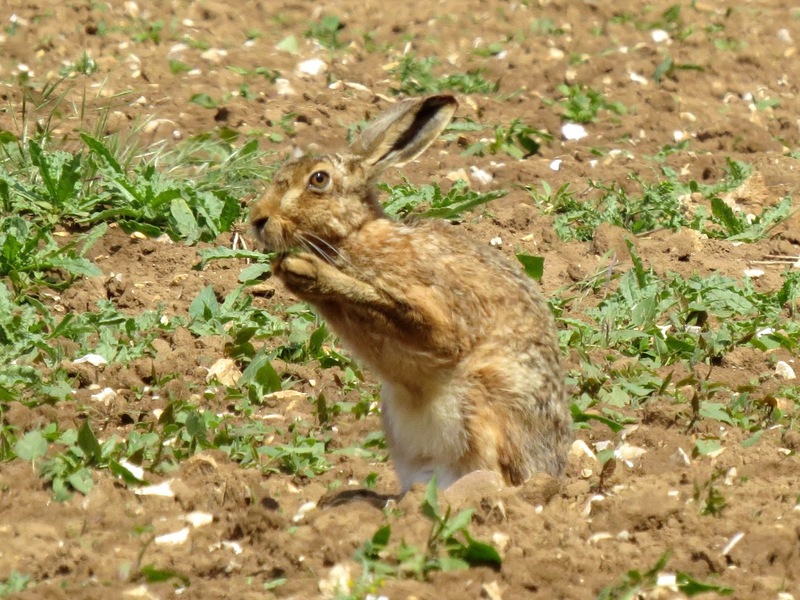 At 46,900 acres the refuge has a varied mix of shallow freshwater marshes, open water, grassy uplands and crop-lands. Like Tule Lake yesterday there is a 10 mile auto route which allows access all year round. Good job too as today it was back to trousers and fleeces with a balmy 9C the high and rolling thunderstorms. I suppose at 4,500ft this is to be expected. 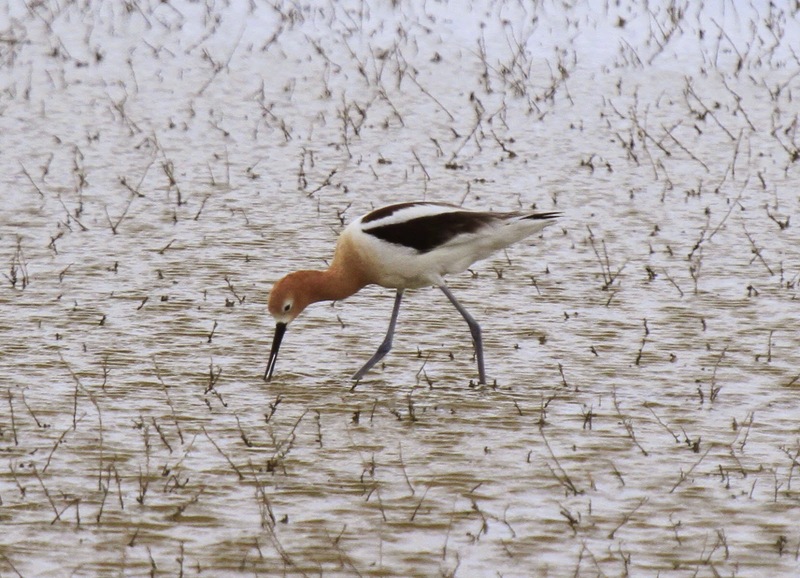 American Avocet - unperturbed by the torrential downpour! We began at White Lake, a smaller marshland area separate from the main trail. It was literally a haven for waders! 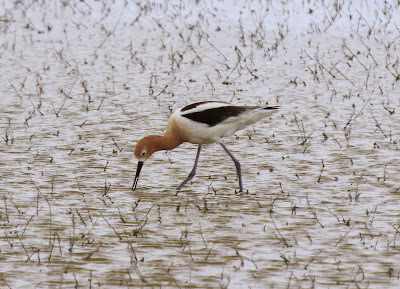 First noted were American Avocet feeding quite close in and several Willet and Killdeer along the roadside. Small numbers of Black-necked Stilt and larger flocks of Long-billed Dowicher (3/4 hundred) were constantly on the move and other flocks in feeding frenzies held Dunlin, Western Sandpiper and within Least Sandpiper were numerous. Out towards the centre, which held shallow water, several Phalaropes could clearly be seen in the scope feeding both in and out of the water. In typical fashion twirling constantly to stir up the waters. These turned out to be Wilson's Phalarope, what a smart looking bird. 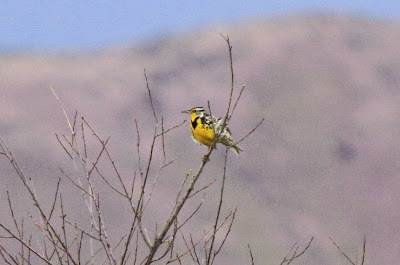 Western Meadowlark - An unexpected addition today! Once on the auto route it's fair to say that we encountered many of the species observed and listed within yesterdays marathon post. With that in mind and to save repetition I've posted almost exclusively the new species recorded today. First of note has to be an American Bittern, which flew along the reedbed meters from the car, offering some decent views before dipping back down and out of sight. 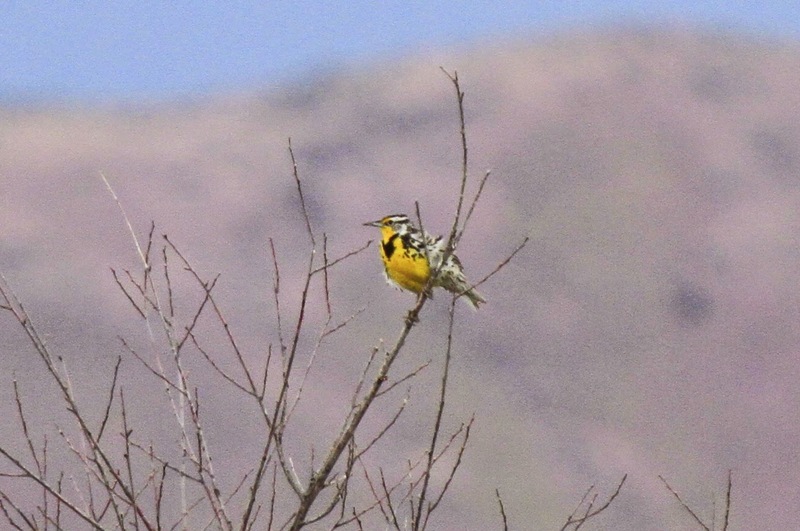 On the grassy uplands a flock of 35 Greater White-fronted Geese and an unexpected Western Meadowlark arrived briefly, offering a few musical notes before departing. 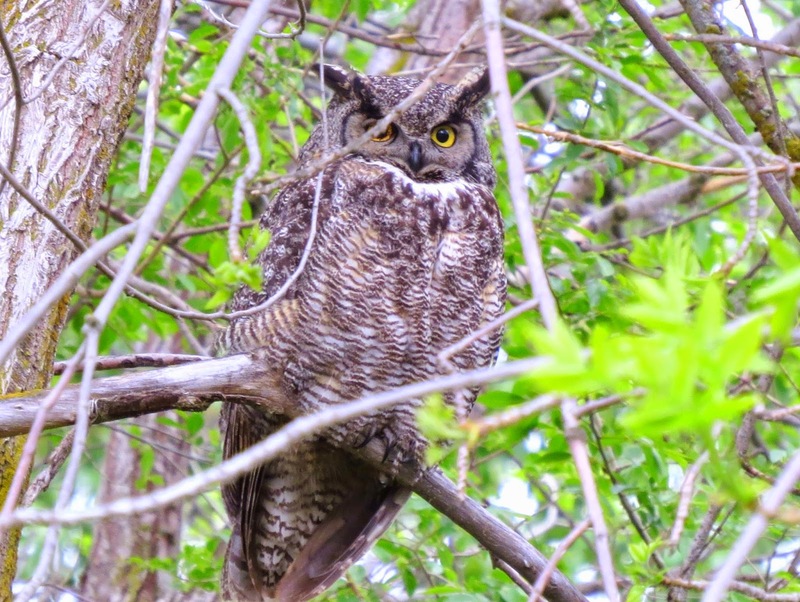 Dee picked out the birds of the day for me when she came across two Great Horned Owls roosting in one of only a few trees on the circuit. 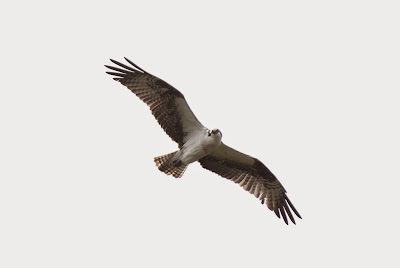 A bird which came in a close second was a Golden Eagle, which had our undivided attention while causing mayhem as it flew low over the open water. 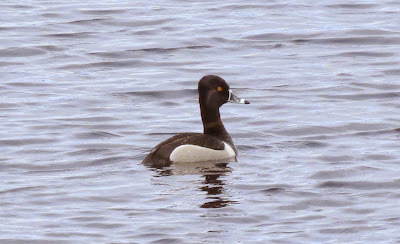 Another thundery downpour brought down a dozen or so passing Black Terns, which hung around feeding over the open water before heading off, our final new species were a dozen Ring-necked Duck. 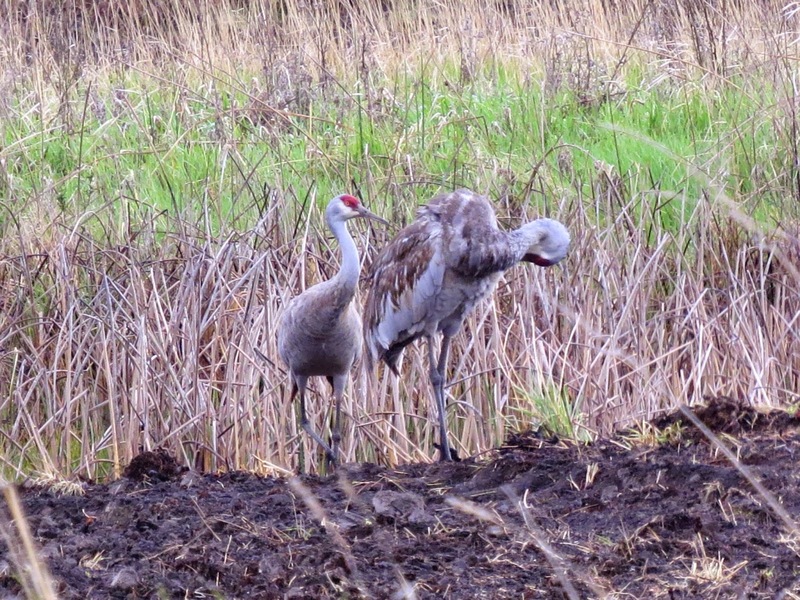 Two out of three Sandhill Cranes in more gloomy conditions, but who's complaining! On route back, a stop at the Klamath Wildlife Area in search of Sandhill Crane before heading off to the hotel. This area runs along the Klamath River just off US 95 and there are several parking areas for observation. Californian Quail are abundant here at it was all we could do not to run any over! A few stops and scans and thankfully it wasn't long before our target bird was in sight, three Sandhill Cranes in yet another downpour. 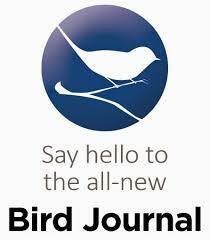 The reedbeds along the river were a cacophony of sound, with many Marsh Wrens in residence. At the boat launch area Caspian Tern and four Common Tern were at rest, along with several Forster's Terns, which seem never to stop fishing. Great Horned Owl - Shame about the twig over the eye but another great image by Dee! 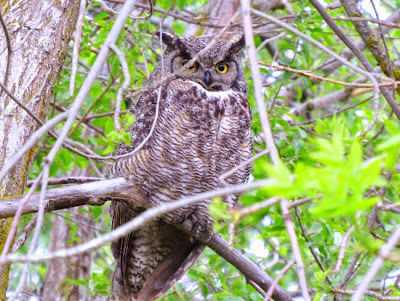 Amazingly, as we drove back out towards the highway my birding guru Dee did it again with a third Great Horned Owl of the day, showing a little better than our earlier two. What a terrific end to our Klamath stay, tomorrow we begin to head back north and our next destination Bend! After our first lay in of the holiday Dee and I decided to drive the relatively short distance and cross states lines into California. 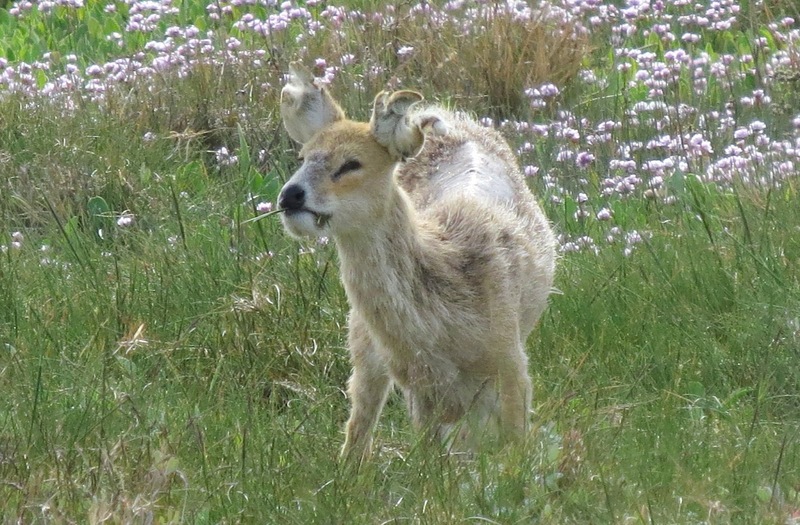 Our reason was to visit Tule Lake National Wildlife Refuge. Across state to California for the day. Established in 1928 , Lake Tule Refuge encompasses 39,116 acres of mostly open water and crop-lands. Around 17,000 acres are leased by farmers under a program administered by the U.S. Bureau of Reclamation. Refuge permit holders farm another 1,900 acres of cereal grain and alfalfa. 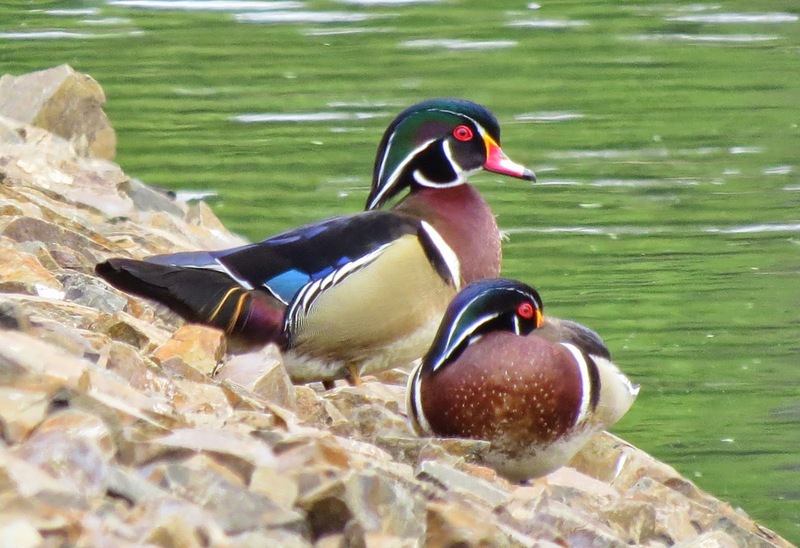 These, crops together with waste grain and potatoes from the lease program, are a major food source for migrating and wintering waterfowl. 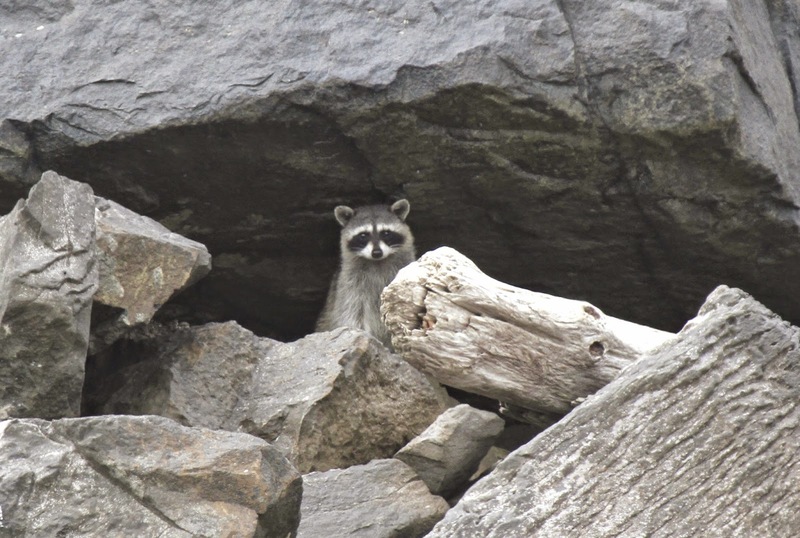 A ten mile auto route allows wildlife observation throughout the year from the comfort of your car. It's so extensive that Dee and spent 5 hours today exploring! 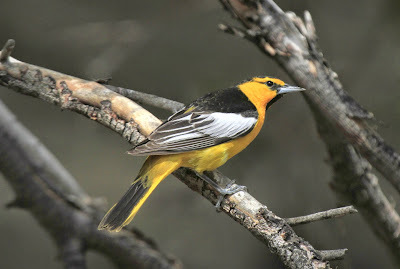 Bullock's Oriole - A pair of these stunning birds around the Nature Centre. 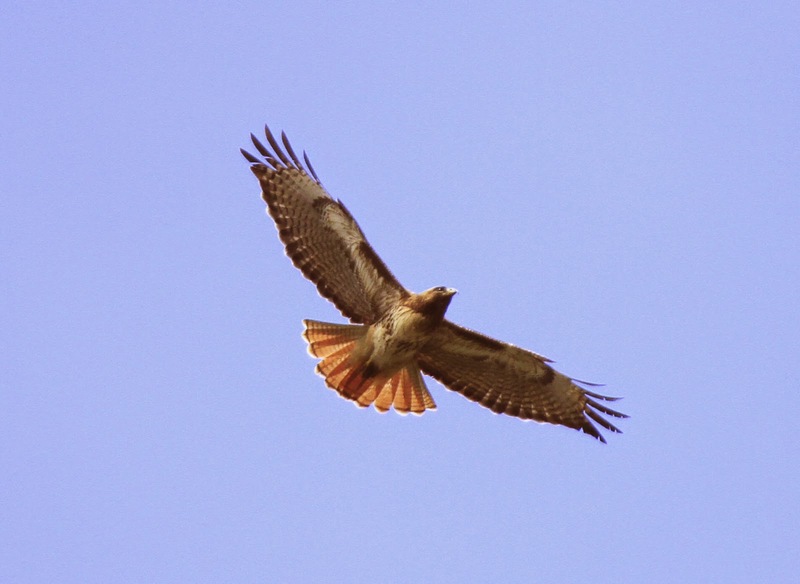 The drive down to the Nature Centre from the highway produced the first highlight of many during an amazing days birding when a Red-shouldered Hawk, our first for North America was perched along the driveway. At the Nature Centre things continued to get off to an extraordinary start when a pair of Bullock's Oriole were putting on a outstanding display. 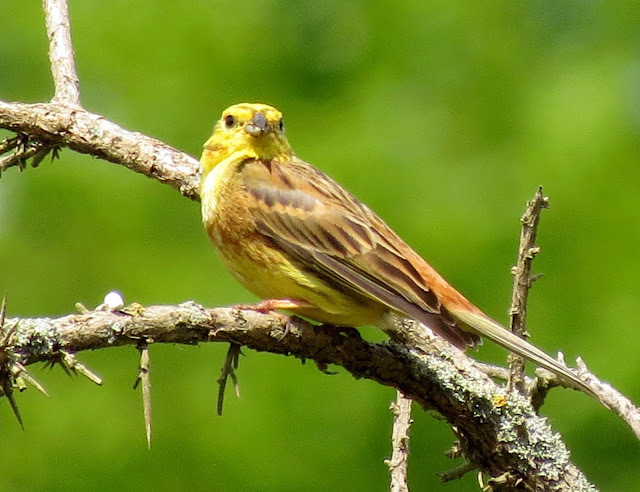 An American Kestrel was perched up watching events and Stellers Jay, House Finch, Brown-headed Cowbird, and American Goldfinch were all noted. To be honest a normal post would not be sufficient to describe the day and include our many photographs in detail, therefore I've decided on this occasion to compile a pictorial of the days events. I hope you enjoy. After moving off from the Centre what followed was quite simply one of the best birding days we've encountered, with over 400 photographs to plough through too! Birds here are literally in their hundreds, if not thousands, some resting up to continue their migration north, many nest building and of course many resident. 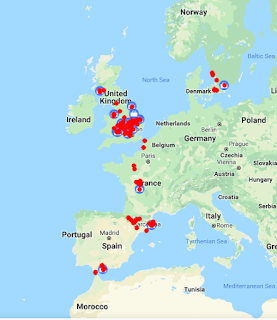 Hirundines were in their hundreds, feeding on the millions of flies and included: Tree Swallow, Cliff Swallow, Barn Swallow, Northern Rough-winged Swallow, Bank Swallow and Violet-green Swallow, a mixture of so many wonderful colours within! There are five Grebes to be found here and we ended up with a full house: Clark's, Western, Eared, Horned and Pied-billed. 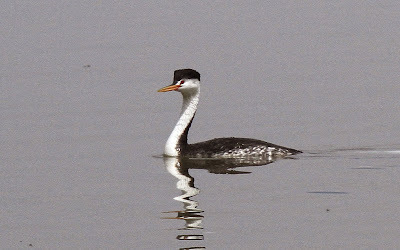 Eared Grebe - Abundant over the whole reserve! 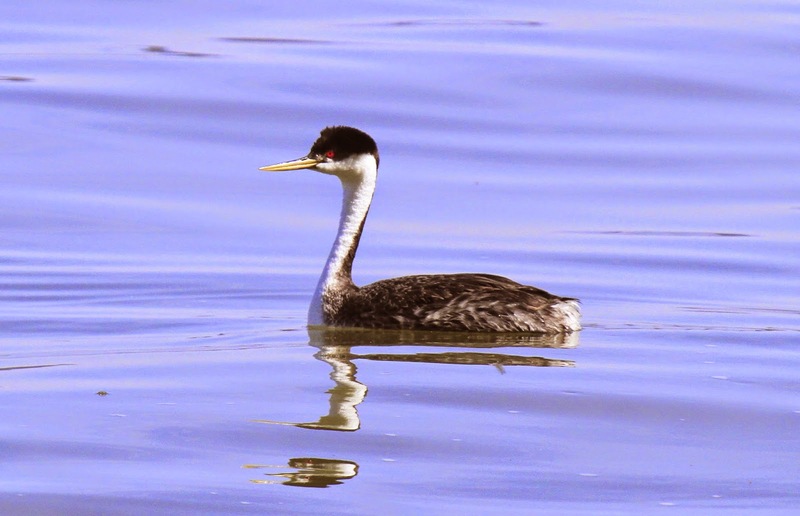 Western Grebe - These birds can be encountered anywhere around Klamath were there's water! A white-faced version of the Western Grebe, the Clark's Grebe formerly was thought to be the same species. 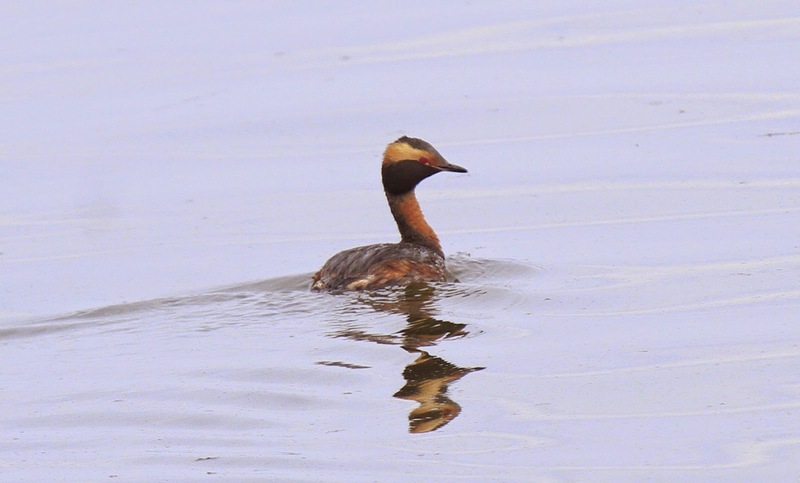 Differences in face and bill colour keep the two grebes from interbreeding. 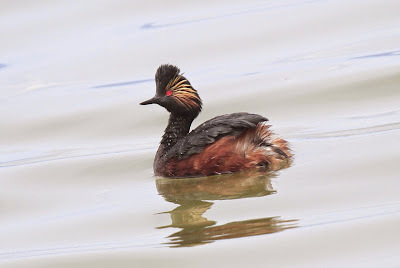 The Horned Grebe is striking in its red-and-black breeding plumage. Its "horns" are yellowish patches of feathers behind its eyes that it can raise and lower at will. 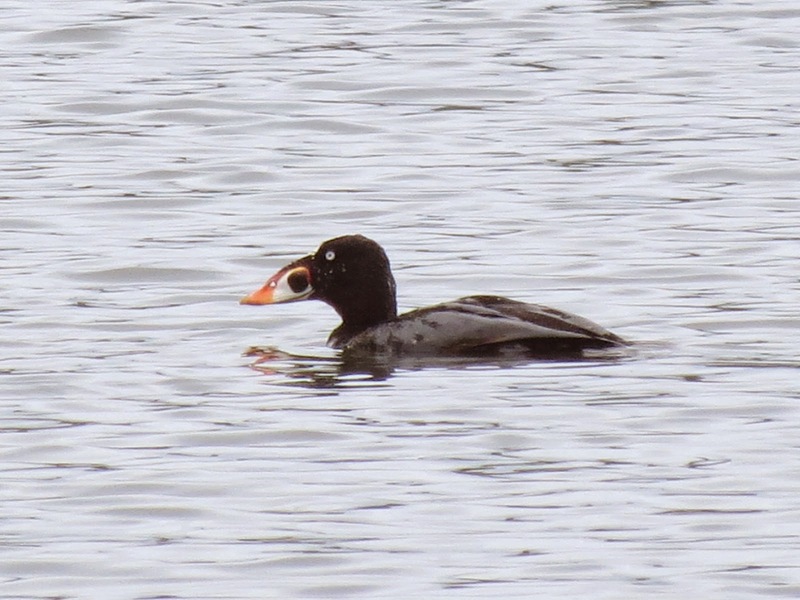 Not as abundant as the Eared Grebe today, we managed two sightings. Part bird, part submarine, the Pied-billed Grebe is common across much of North America. 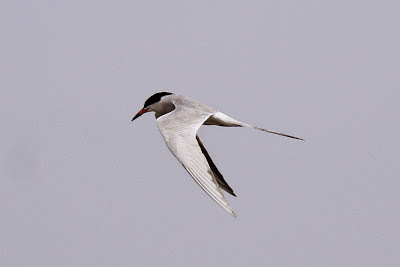 Terns were in large numbers too with many Forster's Tern, Caspian Tern and the odd Black Tern to be found. Equally there were many Bonaparte's Gull, Ring-billed Gull, Californian Gull and a smaller number of Franklin's Gull. Forster's Terns with it's long trailing tail was constantly on the look out for a quick meal. 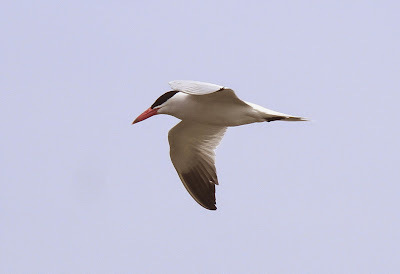 Caspian Tern is the largest tern in the world. Its large coral red bill makes it one of the most easily identified terns throughout its worldwide range. 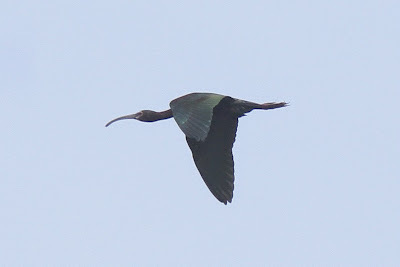 The White-faced Ibis is a western replacement for the Glossy Ibis. Similar in appearance and habits, the two species can be distinguished only by slight differences in colouring of the face and legs. 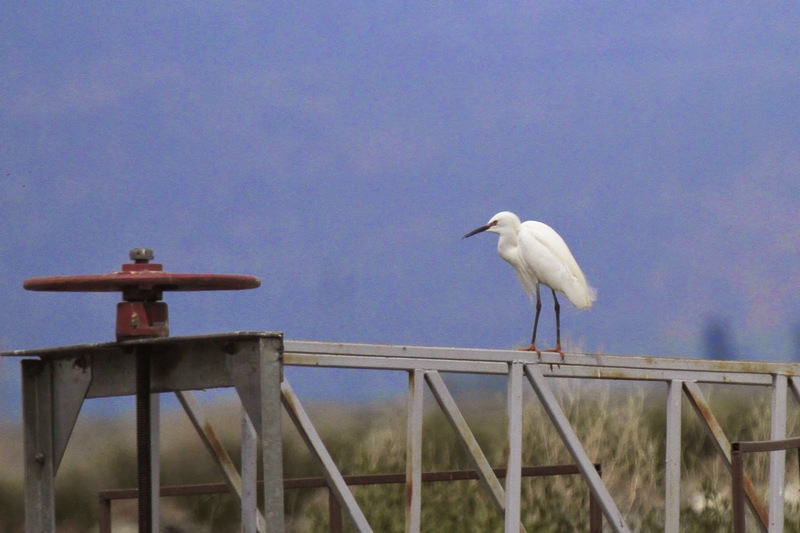 Among the most elegant of the herons here, the slender Snowy Egret sets off immaculate white plumage with black legs and brilliant yellow feet. Huge numbers of White-faced Ibis today along with American White Pelican. Great Egret numbers were in double figures and we managed a single sighting of Snowy Egret. Black-crowned Night Heron numbered around a dozen or so and a brace of Great Blue Heron were also recorded. 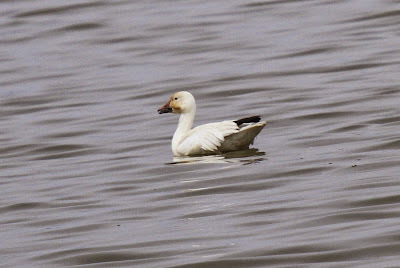 There were some small flocks of Snow Goose to be found and we also came across a singe Tundra Swan. Also of note the only Cormorants to be seen were Double-crested Cormorant. Snow Geese have skyrocketed in numbers and are now among the most abundant waterfowl on the continent. 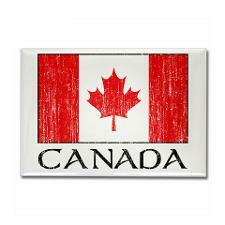 Also represented were the ever present Canada Goose. 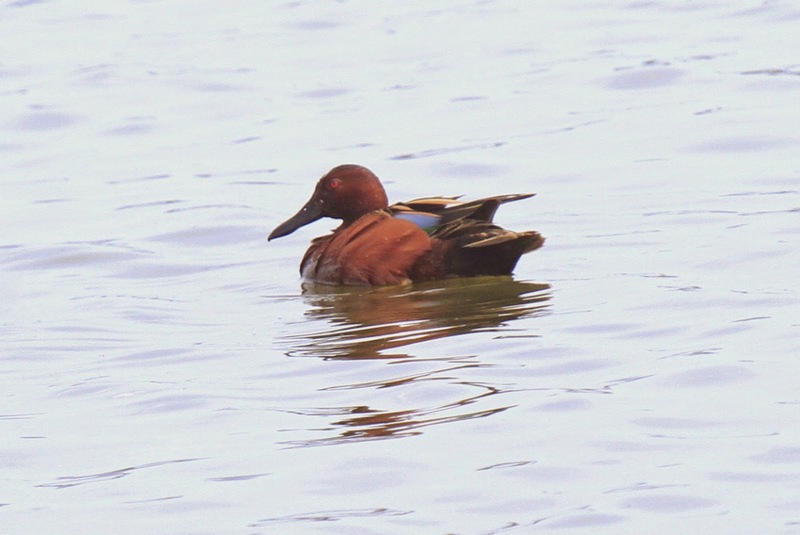 Cinnamon Teal - One of my favourite Teal. This one showing it's blue flash. Wildfowl were abundant and included the gorgeous looking Cinnamon Teal and the more familiar Gadwall. Within the more secluded areas Northern Shoveler and out towards the pool centre Ruddy Duck, Bufflehead, Hooded Merganser, American Wigeon, Canvasback and Redhead. 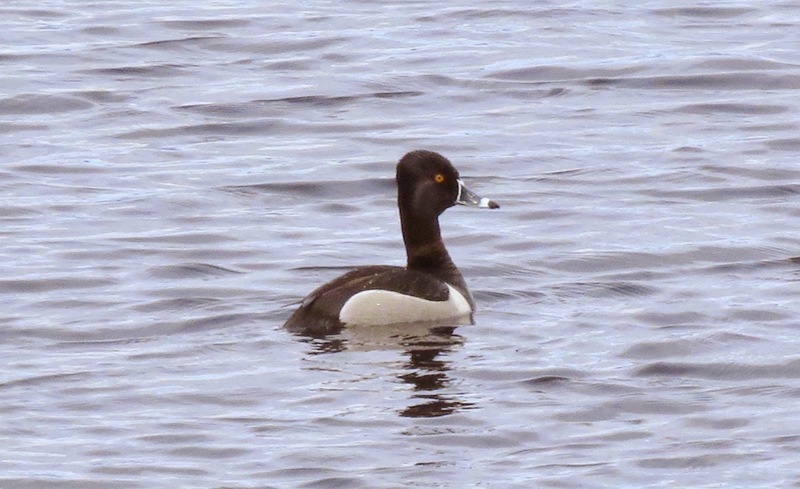 In the many channels that feed off from the main water body Lesser Scaup could be found and American Coot were everywhere. 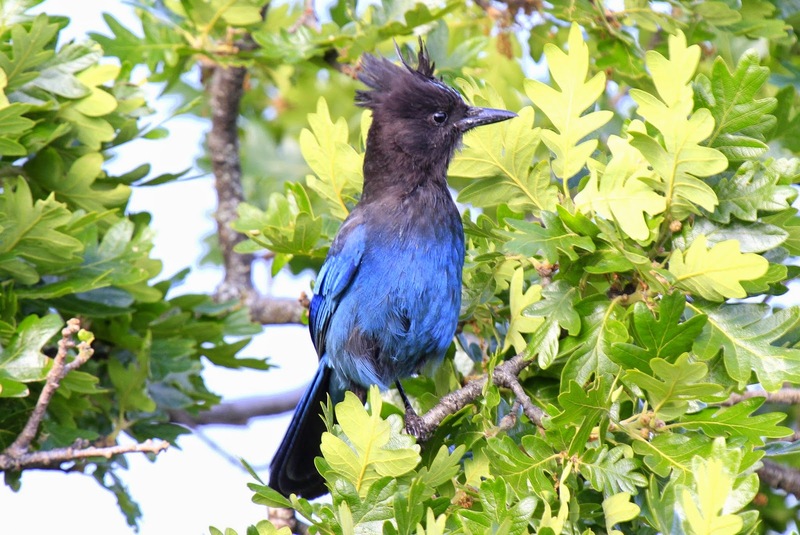 A single Belted Kingfisher was observed as we were leaving the reserve. These stunningly beautiful American Avocet were found in small numbers today! Raptors included Turkey Vulture, Red-tailed Hawk, ♂♀Northern Harrier and while observing a Lewis Woodpecker a Peregrine made an unannounced visit! 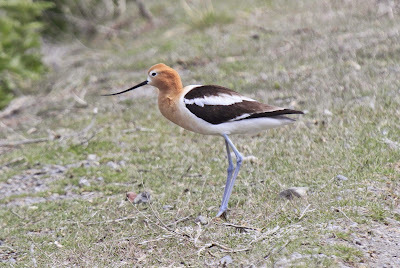 Several species of wader in the mix with Spotted Sandpiper, Long-billed Dowicher, Dunlin, Western Sandpiper, Killdeer, Black-necked Stilt and the stunning American Avocet. Ground and reed hugging birds were also in abundance with Brewers Blackbird , Red-winged Blackbird and Yellow-headed Blackbird. 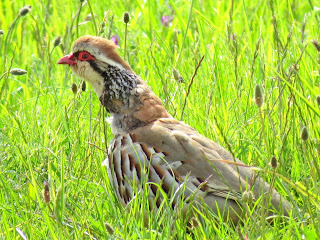 Song Sparrow and Savannah Sparrow, plus Marsh Wren, a pair of Californian Quail and a more familiar but differently named Ring-necked Pheasant. Doves and pigeons to add to the day list included Eurasian Collared Dove, Rock Pigeon and Mourning Dove. 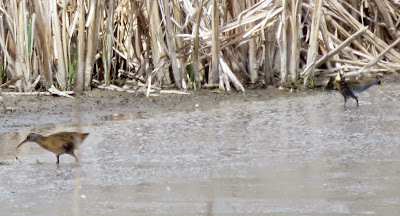 Look closely to see Virginia Rail left and Sora on the right - Well done Dee! 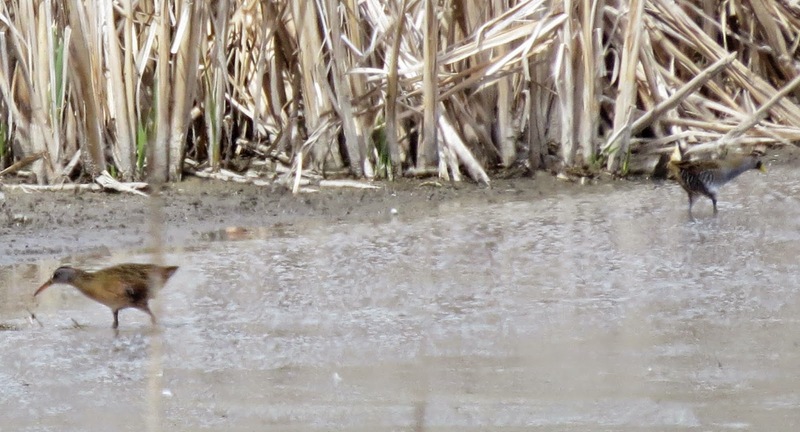 Finally, on my longest ever post an amazing if somewhat blurry image that Dee took of both Sora and Virginia Rail we spotted feeding out in the open on a small section of marsh. Incredible to see both these shy species out in the open feeding together.